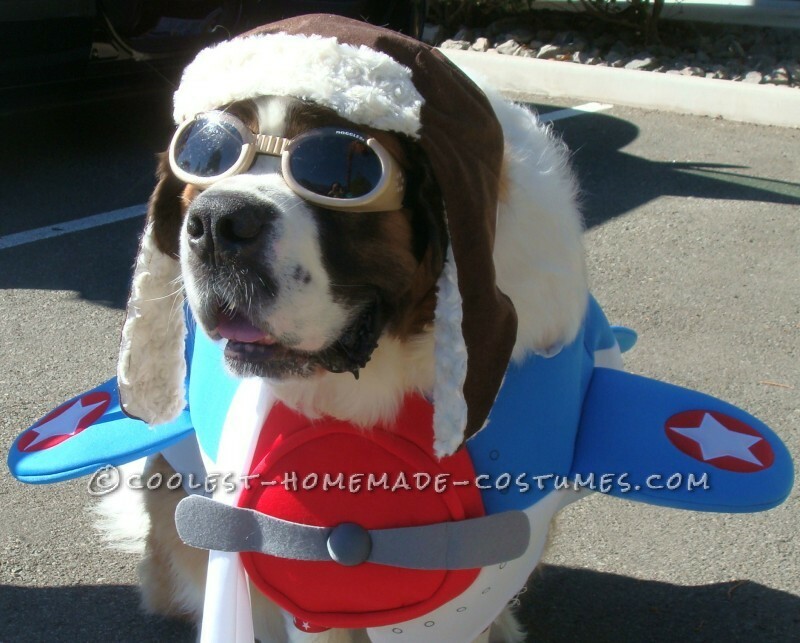 Saint Bernard Dog Costume: Captain America to the Rescue! Snowplow soars within the clouds as Captain America in tribute to the true heroes our men and women in the U.S. military serving America wherever that may take them. In honor of the tremendous work of the service dog and soldier dogs assisting the wounded warriors and veterans the costume is in the light of my reflection as a flight nurse and USAF veteran with a care and concern as we try to make the world a better place. Snowplow’s Pilot-in-training costume is designed using a system approach in the following steps. The airplane is developed from foam and involved several sittings and dog cookies to get the alterations just right on our bundle of love. It is sewn together using both a hand stitch and electronic sewing machine. Every detail is sewn including the iconic Stars on the wings and the propeller. Using Snowplow’s measurements, a pattern was drawn on roll of paper obtained from the discarded rolls at the local newspaper. The template for the Aviator bomber hat was made in the same manner. attached with a large fabric button. The American Stars are appliqued on each of the wings. The landing gear and undercarriage of the costume is adhered with Velcro straps so the costume is soft and cozy for our special pilot. We did a test run for our pilot in training to ensure he could take off with no limitations. The numerous fittings of course required the addition of his favorite cookie treat. The vintage fighter pilot hat was designed using an authentically styled vintage pilot’s flight cap modeled after the WWII pilot. A brown wool suede cloth was used to mimic the leather/wool pilot hat. The hat was made in two layers sewn together The template was created with ear flaps and a low brim for added protection for the wind The hat and lining was sewn together near the edge so the lining would have a finished edge. The lining was constructed from a faux sheepskin. The addition of the flaps made the hat comfortable on Snowplows head. 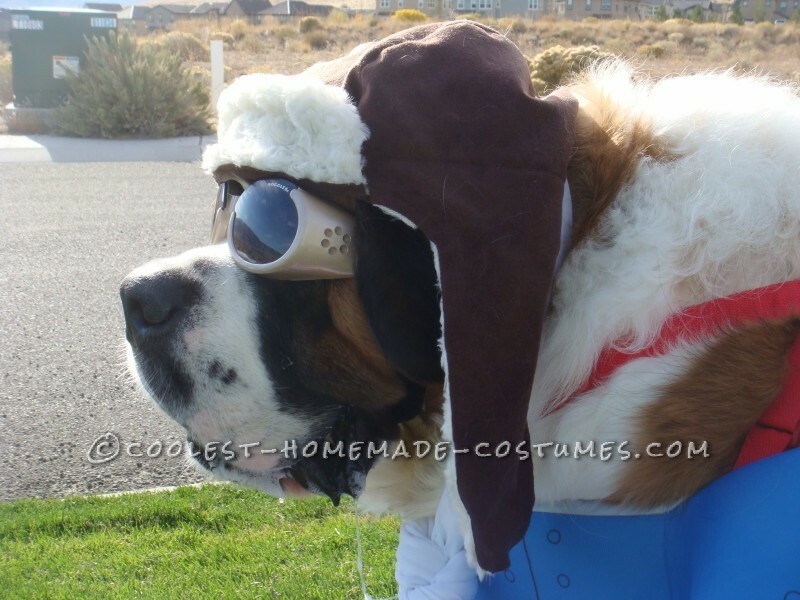 His Gold Doggles were used to resemble the pilots goggles in the same tradition as his WWII counterpart. For an added touch of panache, we added a silk scarf. The white authentic aviator scarf is made from 100 silk and hand sewn It is 6feet by 14 inches to complete his pilot attire. He ready to take off sporting the stars and stripes from the airplane wings to the novelty landing gear of red striped ribbon around his paws. He issues a Mayday to bring attention to our American Heroes with the admiration and care we have for each of them. Snowplow is our 170 lb. bundle of love and certified therapy dog. He loves being involved in everything and the center of attention. His strength of love for family and friends makes him very popular in the neighborhood especially with the children. Everyone wanted to hug him and of course Snowplow returned with his kisses. The reaction ranged from “He’s magnificent” ” He’s beautiful” to “He’s adorable.” Others drew an analogy with Snoopy and his fighter pilot image on his doghouse. Snowplow wants to be part of everything and the center of attention so he was right at home in his airplane and pilot attire..Snowplow is very popular with everyone in the community especially the military and veterans. Snowplow works with the local Saint Bernard Rescue, Saints of the West, 1 of 30 Saint Bernard Shelters in the country dedicated to bring attention to the wonderful efforts in search and rescue and love of this breed. Mayday! Mayday! Please pick me. 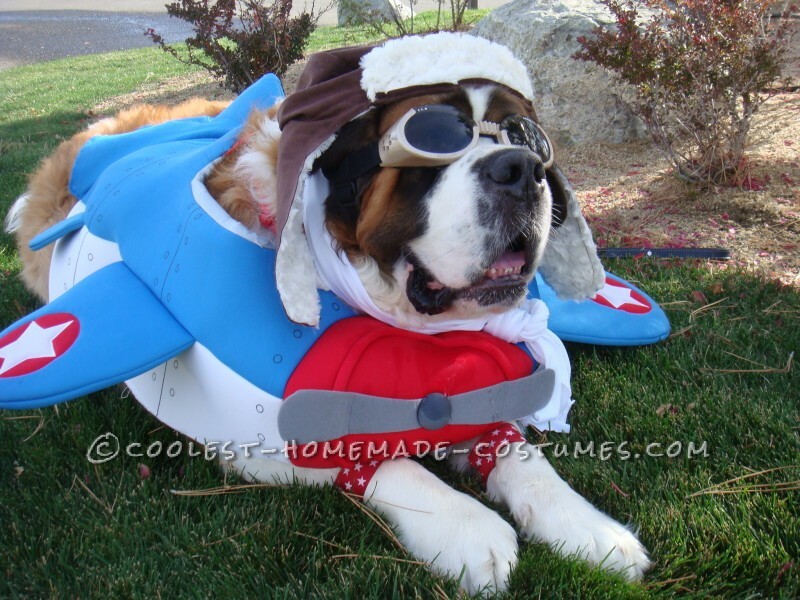 I LOVE SAINT BERNARDS!!! My mom has been breeding them since before I was born. I have a 1.5 year old pup named Dmitri. I have seen this costume over and over again and I AM IN LOVE!!! I have searched high and low for this costume and now know why I couldn’t find it. I did find a toddler’s ride in airplane that looked extremely similar to this, but it is discontinued. I wish I could sew because there is nothing more I want than to make Dmitri this cute! I’ve never dressed my Saints up before and would love to! What other ideas have you had? I LOVE SAINT BERNARDS!!! My mom has been breeding them since before I was born. I have a 1.5 year old pup named Dmitri. I have seen this costume over and over again and I AM IN LOVE!!! I have searched high and low for this costume and now know why I couldnt find it. I did find a toddlers ride in airplane that looked extremely similar to this but it is discontinued. I wish I could sew because there is nothing more I want than to make Dmitri this cute!! Ive never dressed my Saints up before and would love to! What other ideas have you had?